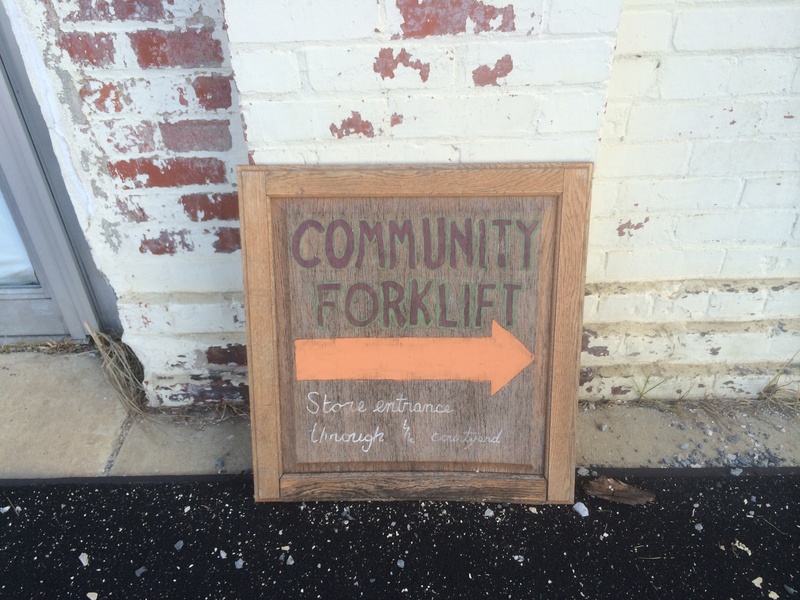 This Saturday, 10/4 at 10am, Urban Living by Alia and GL Barnhart Construction are teaming up to offer our “Top 10 Ways to Spot a Cheap Flip” workshop at Community Forklift! As developers and investors rush to take advantage of DC’s booming real estate market, we are seeing an increasing number of hastily upgraded properties. Homeowners and Buyers alike will benefit from this this tutorial on how to recognize and identify some of the most common telltale signs of a job done quickly, cheaply, and most importantly of all – just plain WRONG. The workshop is free, and more information can be found on the event’s Facebook page. And of course, feel free to email me with questions. Otherwise, see you Saturday! After years of asking for change, Cleveland Park residents could finally see a wider sidewalk along the east side of Connecticut Avenue, which became a service lane and parking lot 50 years ago. How space on Connecticut Avenue is distributed today. Image from DDOT and annotated by GGW. In 1962, a liquor merchant on this stretch of Connecticut Avenue used his political influence to replace the wide sidewalk in front of his store with a “service lane” that effectively serves as a parking lot for 27 cars. Neighbors have been asking for their sidewalk back ever since. Over the last few years, the issue flared up every few months on the Cleveland Park listserv. Polls on that list have consistently shown a two-to-one majority in favor of removing the service lane. Hundreds of neighbors have signed a petition to restore the sidewalk. The first possibility is to keep the current arrangement. While the service lane may have seemed like a good idea in the 1960s, when streetcar service had just ended, it’s completely inappropriate for what is today a vibrant urban neighborhood with a Metro station. For starters, the lane is unsafe. I have two young children, and I can’t walk down the service lane’s narrow sidewalk without gripping their hands. Pedestrians often step off (or are forced off) the sidewalk, sometimes into the path of oncoming traffic. This is a particular problem for older or mobility-impaired persons. The anomalous traffic pattern created by the service lane, with five-way intersections at each end, is disorienting. It’s also unappealing. The strip is drab and ugly; it feels crowded and unwelcoming. The only shade trees are on the median on the other side of the service lane, so there’s no shade or shelter. There’s no room for pedestrian amenities. This study is part of a larger streetscape project that DDOT is working on with Cleveland Park citizens, which has provided park benches, bike racks, and other amenities along other parts of Connecticut Avenue. There’s no room for any of this along the service lane, nor is there room for sidewalk seating for any of the 14 restaurants and cafés along the strip. In this option, the current service lane would rise to the level of the adjoining sidewalk with ramps to allow cars to drive on and off the sidewalk. Parked cars and moving cars would then share this sidewalk with pedestrians. The only advantage to this arrangement that I can see is that it would eliminate the complex intersection geometries we have today where Connecticut Avenue crosses Ordway Street and Macomb Street. But the entry and exit ramps would still create confusion and create pedestrian-vehicle conflicts. Southbound drivers, no longer able to legally turn into the service lane, would be tempted to do a dangerous U-turn up onto the sidewalk just before the intersection. And it’s hard to imagine how the “shared space” would work in practice, with cars driving on the sidewalk alongside pedestrians. There’s no other sidewalk in the District that cars are allowed to park on. Drivers might be more careful while driving on a sidewalk than they are now in the service lane, but I still wouldn’t relax the grip on my children’s hands as I move through the area. Nor would the flex space make room for any new fixed amenities like sidewalk cafés, bicycle racks, or park benches. And we would still lose 7 or 8 parking spaces to make room for the curb cuts. Advocates of this option compare it to the narrow streets in the old city centers of Europe, where cars, pedestrians, and sidewalk cafés sometimes share the road out of necessity. Blurring the line between pedestrian space and roads can sometimes work as a traffic-calming device. But cars already occupy two thirds of the total right-of-way on this stretch of Connecticut Avenue. And even those old European city centers are increasingly becoming car-free or restricting vehicle access to residents only. A third option restores most of the original sidewalk, but cuts two parking bays into it, to create a full-time parking lane alongside Connecticut Avenue that would accommodate 24 cars. Image from DDOT and annotated by the author. This would restore the sidewalk while preserving roughly the current the number of parking spaces available during rush hour. The evening northbound rush hour is when parking is at its most scarce in the neighborhood, so this would preserve parking when it’s most needed. However, this approach would require relocating or replanting several mature trees. It would destroy the symmetry of the avenue’s original design. What this option brings to the forefront is that providing rush-hour parking is the most important role that the service lane provides. But perhaps there’s a better way to ensure parking availability during peak periods. The final option presented by DDOT’s team of consultants requires the least explanation. It would restore this space to its original condition: A wide sidewalk like the one on the west side of Connecticut Avenue, where I can let go of my kids’ hands and let them explore. On that side of the street, there are pleasant cafés, park benches, and lovingly maintained tree boxes full of flowers. Of all of the options (other than doing nothing) this would clearly be the least expensive. It wouldn’t require relocating any trees or infrastructure. It would restore the Connecticut Avenue boulevard’s original grace, symmetry, and human scale, and make valuable public space available for gathering places and amenities. The current service lane would never be approved if it were proposed today. It’s no longer even legal to build a strip mall in the District of Columbia: Zoning now forbids parking spaces between storefronts and the sidewalk on private property, let alone in public space. This was originally a sidewalk. It should be a sidewalk again. And sidewalks are for people, not for cars. This study is our best chance in many years to finally make this commercial strip more walkable and pedestrian-friendly. To express your support for one or more of the options, you can send a quick email to the study team at ideas@CPtransportationstudy.com. And if you’d like to restore the sidewalk to its historic state, you can also sign this petition to our elected representatives. DDOT will hold a third and final public meeting on this study Wednesday, November 6 at the Cleveland Park Neighborhood Library, located at 3310 Connecticut Avenue NW. In the meantime, you can also learn more about the Cleveland Park Transportation Studyand read more about the history of this issue. Attention, cyclists of D.C.: Starting Friday, the 15th Street NW cycle track will be closed for repairs. According to Monica Hernandez of the District Department of Transportation, concrete work will begin Friday to repair curbs, gutters and wheelchair ramps. This will take two weeks. After that, the resurfacing phase will take four to five days followed by two to three days of repaving. (Goodbye, cute messages!) Pavement markings will then be put in place, which will take three to five days. The work should take approximately four weeks in total. Construction will take place between K and Swann Streets NW at one to two block intervals from 9:30 a.m. to 3:30 p.m. The work will cost approximately $500,000. As for an alternative route, well, that aren’t great options. There are unprotected bike lanes on a portion of 14th Street NW, while 16th Street NW is bike lane-less.